On the sacred Martyrdom Day (Shaheedi Gurpurab) of Sri Guru Tegh Bahadur Sahib, Guru Nanak Daata Baksh Lai Mission has released a video album titled "Haun Balihari Satgur Poorey, Saran Ke Daatey Bachan Ke Soorey." The video is offered as a humble tribute at the Lotus Feet of the Beloved Sikh Guru and touches upon His unmatched greatness, sacrifices, and love for His children. 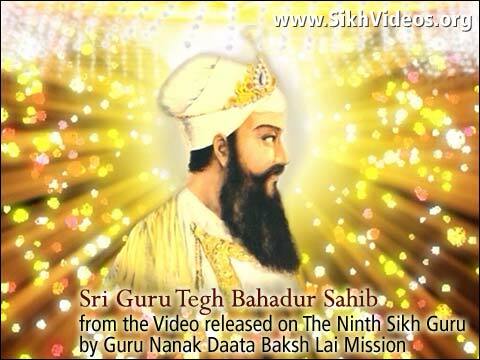 On the sacred Martyrdom Day of Sri Guru Tegh Bahadur Sahib, Guru Nanak Daata Baksh Lai Mission has released a video album titled "Haun Balihari Satgur Poorey, Saran Ke Daatey Bachan Ke Soorey." The video is available for everyone to watch for free on the mission’s websites http://www.SikhVideos.org and http://www.SriGuruGranthSahib.org. Television viewers in the USA may also watch the program telecast on the reputed Punjabi TV channel, Jus Punjabi, on 23rd and 24th November from 5:00pm to 5:30pm (EST). The program is produced and directed by Brig. Partap Singh Ji Jaspal (Retd. ), the head of the mission. It has been offered at the Lotus Feet of the Beloved Sikh Guru and pays humble tribute to His unmatched greatness, sacrifices and love for His children as captured by Brig. Partap Singh Ji Jaspal in one of his writings 'Eternal Glory of Sri Guru Tegh Bahadur Sahib', "When the Almighty manifests himself in human form, he takes the whole human race in His loving Embrace. This God like warmth of the Divine Incarnate flows out to the whole creation and yearns for universal welfare and redemption. This Nectar of Grace and Love flowed from the Beneficient, All Loving Guru Tegh Bahadur (Guru Nanak - The Ninth) to 500 Pandits of Kashmir and through them to a whole religion, a whole nation." Video eCards on the Ninth Sikh Guru, Sri Guru Tegh Bahadur Sahib, have also been released to mark the Sacred occasion. Guru Nanak Daata Baksh Lai Mission, through which the productions and publications of Brig. Partap Singh Ji Jaspal (Retd.) are released, is at the forefront of promoting universality of Sikhism and its Divine Content, embracing the whole mankind as one global family of the sole beloved God. It reaches out to the world through the mediums of internet, TV channels, audio and video productions, and book publications. The mission seeks no publicity and serves the whole global community in the firm belief of oneness of godhood and oneness of the mankind. It consists of only the family members and is based at 203, Sector 33-A Chandigarh Phone: +91 172 2601440.